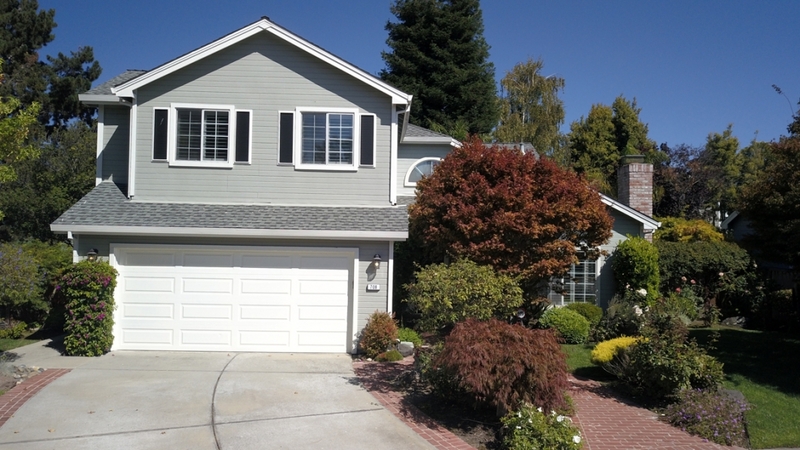 Welcome to prestigious Alden Park, one of Foster City’s finest neighborhoods. This coveted location sports an intimate neighborhood of 84 homes in a planned community with amenities which include a pool, spa, tennis court, clubhouse, fitness room, and children’s play area. Access to Sea Cloud Park and the athletic field is right around the corner—jog, bike or walk down to the levee and Foster City trails. Located on a serene cul-de-sac, this enclave of relatively newer homes is well removed from the SFO air traffic noise noticeably more prevalent in other areas of the city. This two-story home offers a spacious lower living level and includes a combination great room and dining area—illuminated by celestial windows and with access to the side yard conversation patio. An eat-in kitchen and family room with fireplace opens to the meticulously landscaped rear yard. The thoughtfully designed kitchen area looks out upon the entertainment yard and is enhanced with chic granite counters over brilliant white cabinets. A five-burner Thermador® gas range with KitchenAid® stainless hood and microwave is at the center of the food preparation area and flanked by matching KitchenAid® appliances including dual built-in stainless ovens, dishwasher and French door refrigerator. A long credenza allows for the storage of a plethora of kitchen necessities and accoutrements. The family room is open from the kitchen for a communal feeling of integration and boasts a wood burning fireplace. Down a short hallway there is the handsome den, office or media room, with rich custom built-in cabinetry—offering the possibility of a fourth bedroom. Just beyond is a tastefully decorated half-bath, which if expanded upon, could be the home’s third full bathroom. The grand staircase leads to the upper level bedrooms, including a large Owners ensuite overlooking Sea Cloud Park. It offers two closets including a large walk-in with custom organizers. The remodeled bath is host to a taupe-tiled sumptuous indulging deep-jetted soaking tub with marble dual sinks over rosewood cabinetry, and a separate seamless shower. Two additional upstairs bedrooms are steps down the hall—one with a custom built-in study station. A hall bath which services these two rooms features a water closet with shower over tub design segregated from the dual sink wash station. The rear yard is a private tranquil retreat, professionally landscaped with lush tropical inspired flora. It offers a multitude of private entertainment areas including two patios and a welcoming grass play area. Foster City boasts five miles of inter-island waterways for swimming and boating, over 160 acres of park and open space including bike paths, dog exercise areas, a lighted softball field, several soccer and youth baseball fields, tennis courts, basketball courts, picnic facilities, bocce ball courts, walkways, pedway, and a wildlife refuge. Some park areas can even be reserved by residents for your next picnic or special event. Highly rated schools are nearby, and the Edgewater Shopping Center is host to many retailers for shopping and numerous dining options at the water’s edge.